Theodore Ayrault Dodge (28 May 1842 – 1909) was a Union officer in the American Civil War and a military historian of both that war and of the great generals of ancient and European history. He was considered by his contemporaries, as well as several other historians, to be the greatest American military historian of the nineteenth century. Born in Pittsfield, Massachusetts, he received a military education in Berlin and attended University College London and Heidelberg University. Returning to the United States in 1861, he promptly enlisted as a private in the New York volunteer infantry. Over the course of the Civil War, he rose to the rank of brevet lieutenant-colonel, losing his right leg at the Battle of Gettysburg. He served at the War Department from 1864 and was commissioned in the regular army in 1866. In 1870 he retired with the rank of major. Following retirement he lived in Boston until moving to Paris, where he died. He is buried at Arlington National Cemetery. 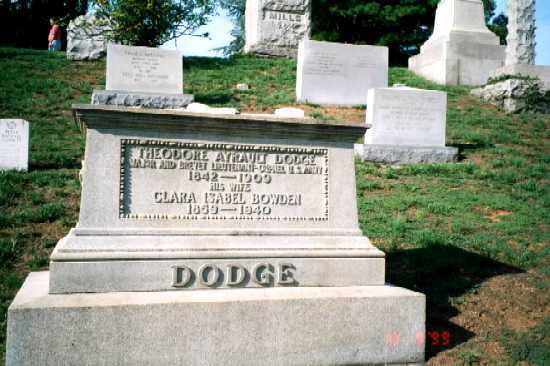 Dodge married Jane Marshall Neil in 1865 and Clara Isabel Bowden in 1893. His works on the Civil War include The Campaign of Chancellorsville (1881) and Bird's Eye View of the Civil War (1883). From 1890 to 1907 he also published twelve volumes of his History of the Art of War: Alexander, Hannibal, Caesar, Gustavus Adolphus, Frederick the Great, Napoleon, although the volumes on Frederick the Great were not completed before his death. The work has been broken up into individual biographies for modern publication. In addition, his military journal, covering his time with the Army of the Potomac from the Seven Days Battles to Gettysburg, has recently been compiled and published by noted historian Stephen W. Sears under the title On Campaign with the Army of the Potomac: The Civil War Journal of Theodore Ayrault Dodge.